Running back Adrian Peterson said Reed (foot) has been working out with him in Houston this offseason, Tarik El-Bashir of The Athletic reports. Analysis: This news bodes well for Reed's availability for offseason workouts after he finished last season on injured reserve with a sprained foot. However, it isn't clear if Reed is participating under any limitations, and it's possible the Redskins could keep the oft-injured tight end under bubble wrap this spring and summer regardless. Coach Jay Gruden believes Reed (foot) is an important part of the Redskins' future, John Keim of ESPN.com reports. "I like Jordan a lot," Gruden said Monday. "Tight ends that can win in zone and man coverage are hard to find. His blocking has improved and is going to continue to get better the stronger that he gets. We just have to get him healthy, but he is a dynamic player, a great athlete, works extremely hard, a great kid, never late and he's a big part of the success of this football team moving forward in my opinion." The Redskins placed Reed (foot) on injured reserve Thursday. Analysis: A move to IR always seemed to be a likely outcome for Reed after he sprained his foot in the blowout loss to the Giants in Week 14. Since suffering the injury, Reed has missed two games and hasn't resumed practicing, closing the door on a potential return for the season finale against the Eagles. With Vernon Davis also working back from a concussion that sidelined him in Week 16 against the Titans, Jeremy Sprinkle could get another look as Washington's top tight end before 2018 comes to a close. Reed (foot) didn't practice Wednesday, John Keim of ESPN.com reports. Analysis: After Reed was held out of a second straight game Saturday in Tennessee, coach Jay Gruden told Kareem Copeland of The Washington Post that the tight end wasn't close to suiting up and would need to make noted strides in his recovery to play Week 17 against the Eagles. Reed has yet to take that step this week, and while two practices remain for him to do so, the Redskins are out of playoff contention and don't have a particular need to get Reed ready for game action. Coach Jay Gruden said Sunday that Reed (foot/ankle) wasn't close to playing in the Redskins' 25-16 loss to the Titans in Week 16, Kareem Copeland of The Washington Post reports. Analysis: Reed missed his second straight game with the injury and didn't practice in any fashion from Tuesday through Thursday before being ruled out. As a result, he'll need to demonstrate significant improvement during the upcoming week to have a shot at playing in what might be a rather meaningless game for Washington. At 7-8, the Redskins are barely in the hunt for a playoff spot and could be eliminated by the time Week 16 action concludes. The Redskins ruled out Reed (foot/ankle) for Saturday's game at Tennessee, Kareem Copeland of The Washington Post reports. Analysis: Reed was expected to miss a second consecutive contest due to a sprained foot and toe injury, which would leave Vernon Davis and Jeremy Sprinkle to split snaps at tight end. However, Davis was listed on the final Week 16 injury report Thursday with a concussion. While Davis is officially questionable, having a head injury diagnosed so close to a game doesn't bode well for an appearance this weekend. 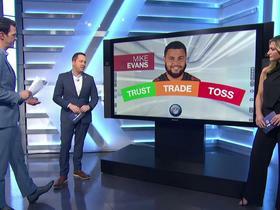 In the event Davis is ruled out as well, Sprinkle and Matt Flanagan would handle the TE reps.
Reed (foot/ankle) was held out of practice Wednesday, John Keim of ESPN.com reports. Analysis: With no practice reps under his belt after two sessions this week, Reed is trending in the wrong direction for an appearance Saturday in Tennessee. If he indeed misses a second game in a row due to a sprained foot and toe injury, the Redskins will turn to Vernon Davis and Jeremy Sprinkle at tight end. Reed (ankle/foot) was listed as a non-participant on Tuesday's injury report, Kareem Copeland of The Washington Post reports. Reed (toe) has been ruled out for Sunday's game in Jacksonville. Analysis: As expected, Reed will miss at least one game after failing to practice in any capacity this week. The Redskins haven't ruled out a return for Week 16 and/or 17, but they probably won't want to take the risk if they don't have a shot at reaching the playoffs. Vernon Davis will take over as the team's top pass-catching tight end for Week 15, facing a Jaguars defense that's been middle of the road defending his position (58 catches for 640 yards and seven TDs on 88 targets). Reed (toe) isn't practicing Friday, Kareem Copeland of The Washington Post reports. Analysis: Coach Jay Gruden said Thursday that Reed is making progress, but the tight end is still expected to miss at least one game. Vernon Davis will take on a larger workload Sunday in Jacksonville. Reed (toe/ankle) was listed as a non-participant in Thursday's practice, Daniel Popper of The Athletic reports. Analysis: The Redskins' practice report confirms what was already anticipated after Reed wasn't spotted on the field on the portion of Thursday's session that was accessible to the media. The tight end looks on track to miss his first game of the season Sunday in Jacksonville, but coach Jay Gruden told John Keim of ESPN.com that Reed is "coming along." That offers a sliver of hope that Reed's injury won't spell an end to his 2018 campaign. Reed (foot) isn't participating in Thursday's practice, John Keim of ESPN.com reports. Reed (toe) didn't practice Wednesday, John Keim of ESPN.com reports. Analysis: Per John Keim of ESPN.com, Reed is dealing with a sprained big toe that is expected to sideline him for this week at a minimum. Since it's no lock Reed will play again this season, Vernon Davis represents an intriguing pickup for fantasy squads in need of an upgrade at tight end. Though Reed's absence would clear a path to more snaps for Davis, his upside may be capped to some extent in an offense helmed by journeyman quarterback Josh Johnson. Coach Jay Gruden said he isn't sure if Reed (toe sprain) will be able to play again this season, John Keim of ESPN.com reports. Reed (foot/toe) is scheduled to have an MRI and may be in danger of missing the rest of the season, Ian Rapoport of NFL Network reports. Analysis: While his foot sprain isn't initially believed to be severe, Reed may have a hard time making it back by the end of the season, especially if his team falls out of playoff contention. He's yet to miss a game in 2018, but he hasn't exactly been the best version of himself after having surgery on both big toes during the offseason. An absence for Week 15 in Jacksonville would leave Vernon Davis as the Redskins' top tight end. Reed was diagnosed with a sprained foot and toe injury after being ruled out for the second half of Sunday's 40-16 loss to the Giants, Kareem Copeland of The Washington Post reports. Reed (foot) won't return to Sunday's game against the Giants. Analysis: Over the course of 75 minutes, Reed's status changed from questionable to doubtful to out due to a foot injury. The precise nature of the issue hasn't been revealed, but the oft-injured Reed is a candidate to have his practice time impacted this coming week. In the meantime, Vernon Davis will receive the majority of tight end reps in Washington. Reed (foot) has been ruled out for the second half of Sunday's game against the Giants, John Keim of ESPN.com reports. Analysis: The Redskins downgraded Reed to doubtful to return shortly before the first half, and with the team trailing by 34 points to begin the third quarter, it's no surprise that he'll be shut down for the day. Before departing, Reed failed to corral his lone target on the day and finished with no receptions for the first time all season. Washington should have an update on the extent of his injury within the next day or two. Reed (foot) has been downgraded to doubtful to return to Sunday's contest versus the Giants, Kareem Copeland of The Washington Post reports. Analysis: On his way to the locker room in the first half, Reed required assistance from the training staff, per John Keim of ESPN.com. Reed has just a slim chance to reenter the game, implying his foot injury is somewhat serious. 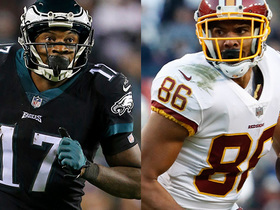 As long as Reed is sidelined, the Redskins will trot out Vernon Davis as the primary tight end. Reed is questionable to return to Sunday's contest against the Giants due to a foot injury. Analysis: Oft-injured in previous seasons, Reed has got through the current campaign mostly unscathed. However, he needed assistance to get to the locker room, as he couldn't put much weight on one of his feet, according to John Keim of ESPN.com. The extent of the injury is not yet known, but Reed will hand over tight end reps to fellow veteran tight end Vernon Davis for the time being. 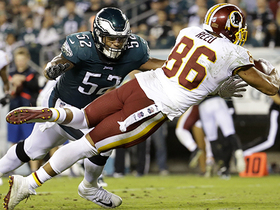 Reed caught four of five targets for 21 yards in Monday night's 28-13 loss to the Eagles. Reed (back) is listed as active Monday in Philadelphia. Analysis: Reed didn't progress beyond a limited session this week, but the Redskins likely were maintaining a cap on his practice reps with his injury history in mind. With his availability clear, his target count could suffer with Jamison Crowder (ankle) and Chris Thompson (ribs) back in the lineup for the first time in weeks. Also hurting Reed's cause is a tough Eagles defense that has contained tight ends to 40.6 yards per game and two touchdowns in 11 outings this season. Reed (back) is listed as questionable on the Redskins' preliminary injury report for Monday's game against the Eagles. Reed (back) remained a limited participant at practice Friday. Analysis: Reed has been bothered by his neck and back on and off the past few weeks, but he hasn't come close to actually missing a game. He actually seems to be doing better with quarterback Colt McCoy under center, catching 13 of 19 passes for 146 yards and a touchdowns the past two weeks. Reed gets a tough matchup Monday against an Eagles defense that's tied for the second-fewest receptions allowed to tight ends (38). Reed was limited at Thursday's practice due to a back injury. Reed isn't participating in practice Monday, Kareem Copeland of The Washington Post reports. Analysis: Heading into a Monday night matchup with Philadelphia in Week 13 after playing on Thanksgiving Day, the 28-year-old tight end has some extra time to recover between games. The reason behind his absence hasn't been reported, but any injury Reed might be dealing with at least wasn't serious enough to prevent him from walking around the practice field in sweats while his teammates warmed up Monday. Washington won't release its first practice report of Week 13 until Thursday. 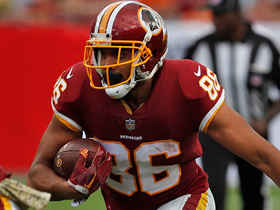 Reed caught six of eight targets for 75 yards during Thursday's 31-23 win over the Redskins. Reed led his team in all receiving categories Sunday, amassing seven catches for 71 yards and a touchdown on 11 targets in a 23-21 loss to Houston. 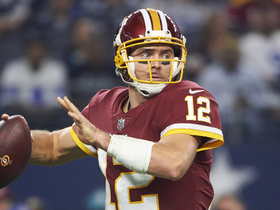 Analysis: Reed caught a 9-yard score from backup quarterback Colt McCoy -- who replaced an injured Alex Smith (leg) -- in the third quarter. The Reed-Smith connection never clicked as well as the tight end's owners hoped, but this display of chemistry with McCoy is encouraging, as Smith's done for the year. Reed will look to build on this performance when the Redskins visit Dallas in Week 12. Reed admitted he's been playing with some pain in both of his big toes, but he said the situation is improving, John Keim of ESPN.com reports. "I feel like I'm starting to come over the curve," Reed said. "[But] I'm still dealing with the pain. I have scar tissue in both my toes, and I've got to run routes and cut hard and slam my feet every day. I'm starting to learn how to manage it, find what works for me and what takes away the pain." Reed caught four of six passes that came his way for 51 yards during Sunday's 16-3 win over Tampa Bay. Reed (back) doesn't have an injury designation for Sunday's game in Tampa Bay, John Keim of ESPN.com reports. Analysis: Reed incredibly made it to Week 9 before showing up on the injury report for the first time all season, ultimately playing through a minor neck injury in a 38-14 loss to Atlanta. He had his reps limited this week while dealing with a back issue, but his status for Sunday never seemed to be in question. With so many injuries at other positions, Washington may need to rely on quick passes to Reed against a soft Bucs defense. No team has given up more yards per game (77.3) to tight ends in 2018. Reed (back) was a limited participant in Thursday's practice, Greg Auman of The Athletic reports. Analysis: Given his troubling health history, Reed's presence on the injury report always carries some degree of concern, but his back issue isn't believed to be a significant one. Still, Reed would alleviate some worry about his availability for this weekend's matchup with the Buccaneers by logging a full practice Friday. If cleared to play, Reed would benefit from a juicy matchup against a Tampa Bay defense that has 8.9 yards per attempt this season, the NFL's second-worst mark. Reed (back/neck) was a limited participant at Wednesday's practice, Kareem Copeland of The Washington Post reports. Analysis: Reed reportedly suffered minor neck and back injuries during Sunday's 38-14 loss to the Falcons, perhaps explaining why he was limited to 38 snaps and six targets in a game that forced Washington to abandon its rushing attack. Despite his long history of injuries, the 28-year-old tight end seems to be on track to play Week 10 at Tampa Bay. Reed (neck/back) caught four of six passes for 34 yards during Sunday's 38-14 loss to Atlanta. Analysis: Reed has now been held under 50 yards receiving in five straight games and hasn't scored since Week 1. He's been hampered by neck and back injuries and has just generally been unproductive in a Washington offense now predicated on Adrian Peterson's running and short passes. If there is a silver lining, a weak Tampa Bay pass defense is in store for next Sunday, though we'll have to see how he's doing on the health front once practice rolls around Wednesday. Reed emerged from Sunday's 38-14 loss to the Falcons with neck and back injuries, Tarik El-Bashir of The Athletic reports. Analysis: Reed dealt with a neck issue in preparation for this game but ultimately was cleared to play, ending the contest with four receptions (on six targets) for 34 yards. The current concern may be the same one, and it appears as if his practice reps will be impacted for a second consecutive week. Reed (neck) practiced fully Thursday. Analysis: Oft-injured historically, Reed's health amazingly wasn't a question mark until the Redskins' first Week 9 injury report. With the upgrade from limited Wednesday to uncapped one day later, he's ready for Sunday's matchup against a Falcons defense that has surrendered 7.2 YPT and three touchdowns to tight ends in seven contests this season. Reed was limited at Wednesday's practice due to a neck injury. Analysis: Reed put together an unusually long stretch of avoiding the injury report to start the season, but the historically health-challenged tight end finally made an appearance Wednesday. His ability to practice in at least some capacity bodes well for his availability Sunday against the Falcons, which will be clarified further by the end of the week. Reed caught seven of 12 targets for 38 yards during Sunday's 20-13 win over the Giants. Analysis: Reed was the only Redskins player with more than five targets on the day, as he finished with a new season high in receptions. Unfortunately, his long gain went for just 12 yards, and he posted an underwhelming 5.0 YPC. Reed continues to receive plenty of looks on a weekly basis, but he's topped 50 yards receiving just twice this season and still hasn't reached the end zone since the opener against the Cardinals. He'll hope to get back on track next Sunday against the Falcons. Reed caught two of four targets for 43 yards during Sunday's 20-17 win over the Cowboys. Analysis: Reed broke off gains of 27 and 16 yards, but his targets were few and far between. While this was a rather modest performance, it still fell right around Reed's per-game average for yardage (44.7) in what has been a rather disappointing season to this point. He'll look to get back on track in a more inviting matchup with the Giants in Week 8. Reed secured five of nine targets for 36 yards in the Redskins' 23-17 win over the Panthers on Sunday. 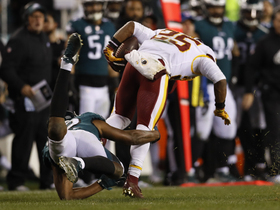 Analysis: Reed saw a team-high target total with Chris Thompson (ribs/knee) and Jamison Crowder (ankle) out of action, which led to a team-best reception haul as well. However, the veteran tight end only averaged 7.2 yards per catch, his lowest figure in any game this season. The 28-year-old has at least remained healthy, always a notable feat in his case given his checkered medical history. He'll look to make a bigger impact against the Cowboys in a Week 7 divisional battle. Reed caught one of two targets for 21 yards in Monday night's 43-19 loss to the Saints. Analysis: Reed was hardly heard from Monday, with his lone reception coming long after the game's result was seemingly decided. Such inactivity made it Reed's worst performance of the season, and Washington's offense really struggled without him making an impact. He and the team will now aim to rebound Week 6 versus the Panthers. Reed brought in four of seven targets for 65 yards in the Redskins' 31-17 win over the Packers on Sunday. Reed caught six of eight targets for 55 yards and lost a fumble in Sunday's 21-9 loss to the Colts. Analysis: Reed finished second on the team in targets and catches, as well as third in yards. Unfortunately for the tight end, he lost a costly fourth-quarter fumble on Indianapolis' 21-yard line. With checkdown machine Alex Smith under center and an underwhelming group of wide receivers, Reed and receiving back Chris Thompson are both primed for big years. 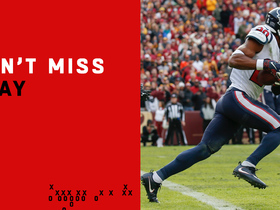 Reed caught four of five targets for 48 yards and a touchdown in Sunday's 24-6 win over the Cardinals. Reed (toe) wasn't listed on the initial Week 1 injury report the Redskins released on Wednesday, JP Finlay of NBC Sports Washington reports. Analysis: Head coach Jay Gruden relayed the news during a media session, adding that Reed is in "great shape." It appears managing Reed's workload throughout training camp and the preseason with his surgically repaired toe in mind has paid off. Reed will turn his focus to Sunday's opponent, the Cardinals, who limited tight ends to 9.7 yards per catch, 6.0 yards per target and six touchdowns last season, though only 11 teams surrendered more receptions (75) to players at the position. Coach Jay Gruden said Reed (toe) is on track to play Week 1 against Arizona, Kareem Copeland of The Washington Post reports. Analysis: Washington has taken a cautious approach throughout the preseason, keeping Reed and RB Chris Thompson (leg) out of games even after they've been full participants at practice. Given his infamous medical record, Reed will need to be tracked closely over the next two weeks, with the first injury report of the season due out next Wednesday (Sept. 5). Reed (toe) won't suit up for Friday's preseason game versus the Broncos, Brian McNally of the Richmond Times-Dispatch reports. Analysis: Reed will thus have one more opportunity (Aug. 30 in Baltimore) to make an appearance before the regular season commences. With the Redskins swapping out Kirk Cousins for Alex Smith during the offseason, Reed has only had practices to build chemistry with his new signal-caller thus far. That said, Smith has worked well with Travis Kelce and teammate Vernon Davis in previous stops, so a healthy Reed is a decent bet to repeat his production from previous seasons. Reed (illness/toe) returned to practice Sunday, John Keim of ESPN.com reports. Analysis: Reed's activity level continues to increase as he makes his way back from offseason toe surgery, but a virus kept him sidelined during Saturday's practice. The tight end has yet to appear in preseason action in order to avoid additional damage to his repaired toe, and his status for Friday's matchup against the Broncos is up in the air. Reed (toe) didn't practice Saturday due to an illness, Kimberley A. Martin of The Washington Post reports. Analysis: Reed entered training camp with less than ideal conditioning because he couldn't run in the preceding month. Toe surgery was the reason, but on a positive note, his workload has been increasing of late. Coach Jay Gruden termed the illness "a virus," so the current concern may be one that only affects Reed in the short term. Reed's likely last chance to take the field in the preseason is Friday, when the Redskins take on the Broncos. Reed (toe) isn't suited up for Thursday's preseason game versus the Jets, John Keim of ESPN.com reports. Analysis: The Redskins haven't given Reed the all-clear for game action yet, likely giving him just one more chance to suit up during exhibition season (Friday, Aug. 24 against the Broncos). In the meantime, he'll continue to ramp up his conditioning after he was unable to run in the month leading up to training camp. Reed (toes) has increased his workload as training camp has progressed, John Keim of ESPN.com reports. Reed (toe) is expected to get some full-team work Saturday, Rich Tandler of NBC Sports Washington reports. Analysis: Limited to individual drills and 7-on-7 work in the early days of training camp, Reed has apparently made enough progress to ramp up his workload for fan appreciation day at the Redskins' training camp Saturday. He's coming back from surgery on both big toes, with the first procedure taking place in December and the second in February. The hamstring injury that landed him on injured reserve last season doesn't seem to be an issue anymore. Reed (toe) ran routes and corralled passes during 7-on-7 drills at Saturday's practice, John Keim of ESPN.com reports. Analysis: The activity marked Reed's first in the team portion of training camp sessions, but his number of routes (three) and receptions (two) were minimal. Within those drills, he was required to plant and cut, and one of his catches forced him to dive, so Saturday's development was still a positive one. Expect Reed to continue ramping up his workload on the heels of two surgeries on his big toes in a three-month span between December and February. Reed (toe) handled individual drills at Thursday's practice, John Keim of ESPN.com reports. Reed (toe) is uncertain for the start of training camp, Rich Tandler of NBC Sports Washington reports. "His rehab schedule is on track to being ready, and I like where he's at," said Redskins coach Jay Gruden. "His upper body strength is great. I think he's on track to be there for training camp. We'll wait and see." Reed (toe) worked on some agility drills off to the side during Wednesday's OTA session, John Keim of ESPN.com reports. Analysis: Reed didn't take part in last week's OTA opener for the Redskins, but it appears he's doing well in his recovery from offseason toe surgery. The 27-year-old tight end has proven himself a prolific pass catcher, but health has been a consistent issue. Reed hasn't played more than 14 games in a season during his five-year career, playing 12 or fewer in four of them. He will also have to develop a rapport with new quarterback Alex Smith. Reed (toe) didn't participate in Wednesday's OTA session, John Keim of ESPN.com reports. Analysis: Reed continues to recover from toe surgery and is expected to miss the entirety of OTAs because of it. The injury-riddled Reed has managed to play more than 12 games just once in his career and was limited to six last season due to a combination of shoulder, rib and hamstring issues. Redskins head coach Jay Gruden hopes to have Reed back to full health by training camp, when the tight end will attempt to get acclimated with new quarterback Alex Smith. Redskins coach Jay Gruden seemed to confirm that Reed (hamstring) is recovering from toe surgery, Stephen Czarda of the Redskins' official website reports. "I think [Reed]'s had some procedures done on his toes and now it's just a matter of the rehab and he's been working hard at it," Gruden said. "He's been working on his upper body while his toe are recovering, so hopefully we'll see a 100 percent healthy Jordan by training camp." Reed (hamstring, toe) is unlikely to participate in Organized Team Activities in May, JP Finlay of NBC Sports Washington reports. Redskins head coach Jay Gruden expects Reed (hamstring, toe) to be healthy for the 2018 season, Stephen Czarda of the team's official website reports. "We anticipate him being fully healthy," said Gruden. "If something does happen, knock on wood, which I don't think it will, we'll adjust like we have every year." Redskins head coach Jay Gruden revealed Wednesday that Reed (hamstring) could require toe surgery, Kimberley A. Martin of The Washington Post reports. 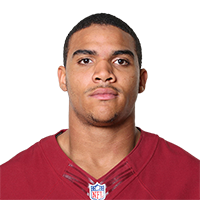 The Redskins placed Reed (hamstring) on injured reserve Tuesday, Stephen Czarda of the team's official site reports. Analysis: The "will he or won't he" return has reached its conclusion, as the Redskins have opted for the former with their No. 1 tight end. With a hamstring injury capping Reed to six games, he'll finish 2017 with career lows in receptions (27), targets (35) and receiving yards (211), while reaching the end zone twice. For the remainder of the campaign, Vernon Davis will be the most utilized TE on the roster, but Niles Paul and even Jeremy Sprinkle should earn some reps.
Reed (hamstring) has been ruled out for Sunday's road game against the Chargers. Analysis: Earlier in the week, head coach Jay Gruden noted injured reserve hasn't been considered for Reed at this point in the season, suggesting the tight end may make an appearance by Week 17. That said, Reed hasn't played since Week 8 nor taken part in practice since Week 10, so there's no telling when his health will improve enough to suit up on game day. In the meantime, the duo of Vernon Davis and Niles Paul will handle tight-end reps.
Redskins head coach Jay Gruden said injured reserve isn't an option for Reed (hamstring) at this juncture, even though the tight end is expected to miss a sixth straight game Sunday against the Chargers, JP Finlay of NBC Sports Washington reports. Analysis: Reed hasn't played in a game since Week 8 or practiced since Week 10, with the Redskins essentially falling out of the playoff hunt during his prolonged absence. The team has no real incentive to rush him back into action if he's still hurting, but there's also not much point in ruling out Reed's return at some point after Week 14. Vernon Davis and Niles Paul have been filling in at tight end, with the latter eating into the former's targets the past couple weeks. Reed (hamstring) isn't expected to play in Sunday's game against the Chargers, Adam Schefter of ESPN reports. Analysis: In line for a sixth consecutive absence, Reed remained a spectator at Wednesday's practice, according to JP Finlay of NBC Sports Washington. Since injuring his hamstring Week 8, Reed's only practice activity occurred during Week 10, when he managed a pair of limited sessions. Until he proves his health in practice, he doesn't seem like a candidate for active statuses on game days. Expect Vernon Davis to continue holding down the fort at tight end. Reed (hamstring) isn't practicing Wednesday, John Keim of ESPN.com reports. Reed (hamstring) didn't take part in Monday's practice, John Keim of ESPN.com reports. Reed (hamstring) has been ruled out for Thursday's game at Dallas, Stephen Czarda of the Redskins' official site reports. Analysis: Reed will miss his sixth consecutive game due to a lingering hamstring injury, which prevented him from practicing in any capacity this week. The Redskins will receive an extended break after Thursday's game, taking the field Dec. 10 versus the Chargers, so Reed will be afforded additional time to recover prior to his next potential appearance. In his stead, Vernon Davis will continue to hold down the fort at tight end. Reed (hamstring) did not participate in Tuesday's practice, John Kelm of ESPN.com reports. Analysis: It looks like Reed is on track to miss his fifth straight game after missing two practices to start a short week. Expect an official update on Reed's status to come in the next day or so, while veteran Vernon Davis will continue operating as the team's starting tight end in his absence. Reed (hamstring) wasn't present for the Redskins' practice Monday, John Keim of ESPN.com reports. Analysis: According to Keim, Reed wasn't among the injured Washington players that worked out on the side field with athletic trainers, suggesting he's trending toward another absence for Thursday's game against the Cowboys. While Reed has been sidelined the last four contests, Vernon Davis has taken over as the Redskins' starting tight end, hauling in 16 of 27 targets for 215 yards during that span. Head coach Jay Gruden said Reed (hamstring) didn't run during Sunday's session, JP Finlay of NBC Sports Washington reports. Analysis: The Redskins intend to keep Reed from running for at least a few more days, ensuring an indefinite return timetable from his ailing hamstring. Because the Redskins play Thursday at Dallas, he's trending toward a fifth consecutive absence, but time will tell if the preceding comes to pass. Assuming another DNP, the Redskins will depend on Vernon Davis at tight end yet again. Redskins coach Jay Gruden said Friday that he still isn't sure when Reed (hamstring) will return, Master Tesfatsion of The Washington Post reports. Analysis: The Redskins normally would have a long week after playing on Thanksgiving, but they'll instead face the Cowboys on Thursday in Week 13. The team then has a long week ahead of its game against the Chargers on Dec. 10, perhaps giving Reed a realistic target to return from his lengthy absence. He's missed the last four games but could return to face the Cowboys next week if he makes it back to practice at some point between Monday and Wednesday. Reed (hamstring) has been ruled out for Thursday's contest against the Giants, Kimberley A. Martin of The Washington Post reports. Analysis: Reed hasn't practiced since turning in a limited session Nov. 9, so it's no shock he won't take the field for a game exactly two weeks later. With back-to-back Thursday games on tap for the Redskins, Reed's next chance to show where he stands in his recovery will come during the team's walk-through Monday. In the interim, though, Vernon Davis will receive another start at tight end. Reed (hamstring) didn't take part in Tuesday's practice. Analysis: Reed will probably need to put in at least a limited practice Wednesday to have a shot at suiting up Thanksgiving Day against the Cowboys. Given that Reed has been sidelined for the last three games and still hasn't resumed taking part in full drills with the team, it seems more likely than not he'll be in store for another absence Thursday, paving the way for Vernon Davis to earn another start at tight end. Reed (hamstring) was listed as a non-participant on Monday's injury report for Thursday's game against the Giants. Analysis: Reed didn't come all that close to playing in Sunday's 34-31 loss to the Saints, getting ruled out Friday on the final injury report of the week. With the Redskins playing on Thanksgiving, another absence seems likely for the fifth-year pro. Vernon Davis has averaged 5.3 catches for 68.3 yards on 7.8 targets in the four games Reed's missed this season. Reed (hamstring) has been ruled out for Sunday's game in New Orleans, John Keim of ESPN.com reports. Analysis: Previously expected to be a game-time decision, Reed was instead ruled out Friday after failing to practice in any capacity this week. He admitted to suffering a setback at practice last week, which explains why he was held out last Friday after managing limited practices Wednesday and Thursday. Vernon Davis has 18 catches for 206 yards and a touchdown on 25 targets in the three games Reed has missed this season. Reed (hamstring) said Thursday that he would be a game-time call for Sunday's game against the Saints, JP Finlay of NBC Sports Washington reports. Analysis: Reed admitted he suffered a setback with his hamstring last week, which explained his downgrade from limited sessions Wednesday and Thursday to no activity Friday. Seemingly poised for a questionable designation in Week 11, Reed added his availability will come down to "how [he's] feeling Sunday." By any measure, fellow tight end Vernon Davis can be expected to be heavily involved again, no matter if Reed is deemed active. Reed (hamstring) didn't practice Wednesday, Brian McNally of the Richmond Times-Dispatch reports. Analysis: Though the Redskins labeled Reed a non-participant, he put in some work on the side Wednesday, per McNally. The development doesn't exactly mean Reed is trending toward a return for the Week 11 matchup with New Orleans, as he started last week with back-to-back limited practices before missing his second straight game in Sunday's loss to the Vikings. Reed (hamstring) is listed as inactive Sunday against the Vikings, John Keim of ESPN.com reports. Analysis: Reed signaled a return was possible with limited practices both Wednesday and Thursday, but a red flag arose with no activity Friday. Consequently, the Redskins will take no chances with their No. 1 tight end for the second consecutive game, allowing Vernon Davis to slot in as the starting TE yet again. Reed (hamstring), who is listed as questionable for Sunday's game against the Vikings, isn't expected to play in the contest, a source informed Ian Rapoport of NFL Network reports. Analysis: After turning in limited practices Wednesday and Thursday to begin the week, Reed took a step back Friday, failing to practice in any capacity. It appears that will be enough to keep Reed sidelined for a second straight week, paving the way for Vernon Davis to start at tight end and likely enjoy plenty of involvement in the Washington passing attack. In the Redskins' Week 9 win over the Seahawks, Davis reeled in six of nine targets for 72 yards. Reed (hamstring) is listed as questionable for Sunday's game against the Vikings, Master Tesfatsion of The Washington Post reports. Analysis: A limited participant the previous two days, Reed didn't practice in any capacity Friday, suggesting he's less than 50-50 to suit up come Sunday. This still marks an improvement from last week, when he missed every practice and was ruled out on the Friday injury report. The Redskins likely will limit Reed's role if he ends up playing, whereas Vernon Davis figures to handle a hefty snap count if Reed is absent. The Redskins have a 1:00 p.m. ET kickoff. Reed (hamstring) isn't practicing Friday, John Keim of ESPN.com reports. Analysis: Reed was listed as a limited participant the past two days, managing some individual work Wednesday and then taking part in one-on-one red zone drills Thursday. His absence from Friday's practice suggests he isn't expected to play in Sunday's game against the Vikings, though it would be unwise to make any assumptions before the Redskins release their final injury report Friday afternoon. Reed (hamstring) was listed as a limited participant during Thursday's practice. Reed (hamstring) took part in limited individual drills at Wednesday's practice, ESPN.com's John Keim reports. Reed (hamstring) was limited at Wednesday's practice, Rich Tandler of NBC Sports Washington reports. Analysis: Reed was held out of practice last week and ruled out on the final injury report for Sunday's win over the Seahawks. Redskins head coach Jay Gruden said Monday that he views the tight end as day-to-day, a statement that's supported by Reed's ability to log a limited practice Wednesday. Reed at least has some shot to play Sunday against the Vikings. Redskins head coach Jay Gruden said Monday that Reed (hamstring) is "day-to-day" ahead of the team's Week 10 game against the Vikings, John Keim of ESPN.com reports. Analysis: Reed was unable to practice in any capacity last week while managing the hamstring injury. While Gruden has said Reed is making progress with his recovery, the tight end will need to prove as much by practicing on at least a limited basis this week to create any optimism he'll be able to play Sunday against the Vikings. Vernon Davis (hand) started in place of Reed in the Week 9 victory over Seattle, catching six balls for 72 yards. Reed (hamstring) has been ruled out for Sunday's game in Seattle, John Keim of ESPN.com reports. Reed (hamstring) isn't taking part in practice Friday, John Keim of ESPN.com reports. Analysis: Redskins head coach Jay Gruden expressed skepticism Monday that Reed would be able to suit up for the Week 9 matchup with the Seahawks, and little has changed that assessment since that time. Reed wasn't present for any of the Redskins' three practices this week, likely paving the way for Vernon Davis to serve as the team's starting tight end Sunday. Reed (hamstring) didn't participate in Thursday's practice. Analysis: Given that Redskins head coach Jay Gruden previously suggested that Reed is unlikely to play Sunday against the Seahawks, it shouldn't come as much of a surprise that he's failed to take part in either of the Redskins' practices this week. Vernon Davis looks poised to pick up a start at tight end in Week 9 with Reed seemingly trending toward an inactive status. Reed (hamstring) didn't practice Wednesday, the Redskins' official website reports. Analysis: Redskins coach Jay Gruden already said that he doesn't expect Reed to be available for Sunday's game in Seattle. Barring an unexpected return to practice by the end of the week, Vernon Davis will serve as the Redskins' top tight end in a difficult matchup. 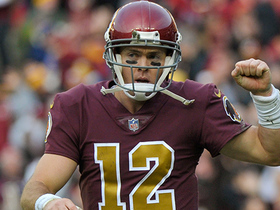 Washington Redskins quarterback Colt McCoy finds his tight end Jordan Reed for 20 yards on a nice play. 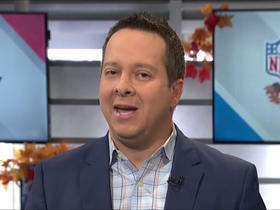 NFL Media's Senior Fantasy Analyst Michael Fabiano gives his starts and sits for the Thanksgiving games in Week 12. 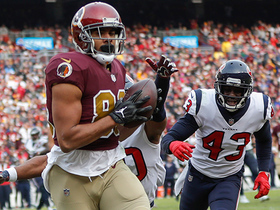 Washington Redskins quarterback Alex Smith finds tight end Jordan Reed for a 12-yard gain.